Are you looking for a quick & healthy grab-n-go breakfast or snack idea? Then this recipe is for you! 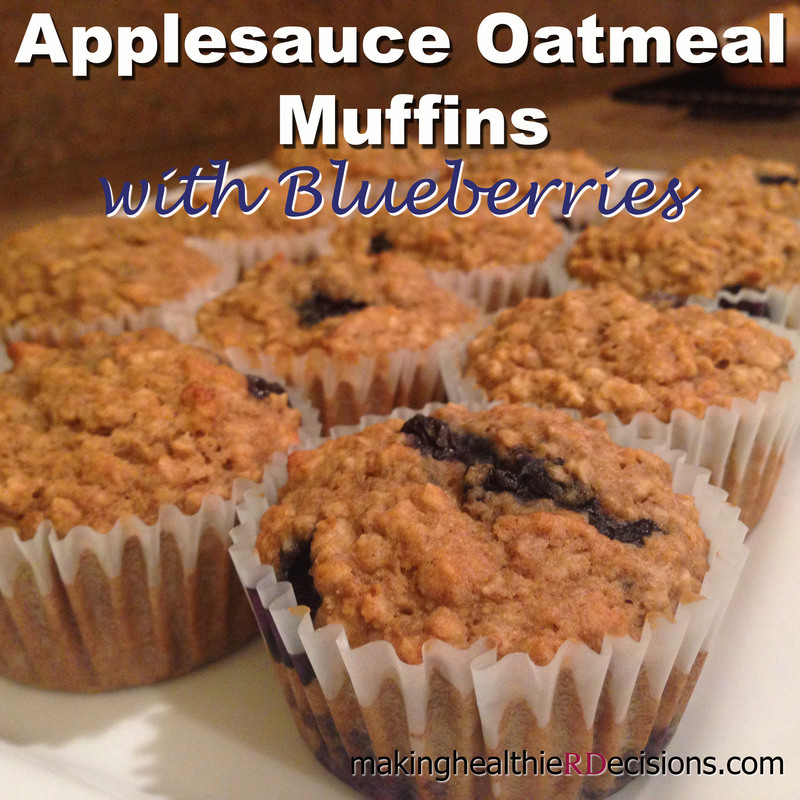 These Applesauce Oatmeal Muffins with Blueberries are easy to make, healthy, and tastes amazing! I was trying to find the perfect muffin recipe for a group of middle school students, who attended my 10-hour nutrition education program during the month of June. 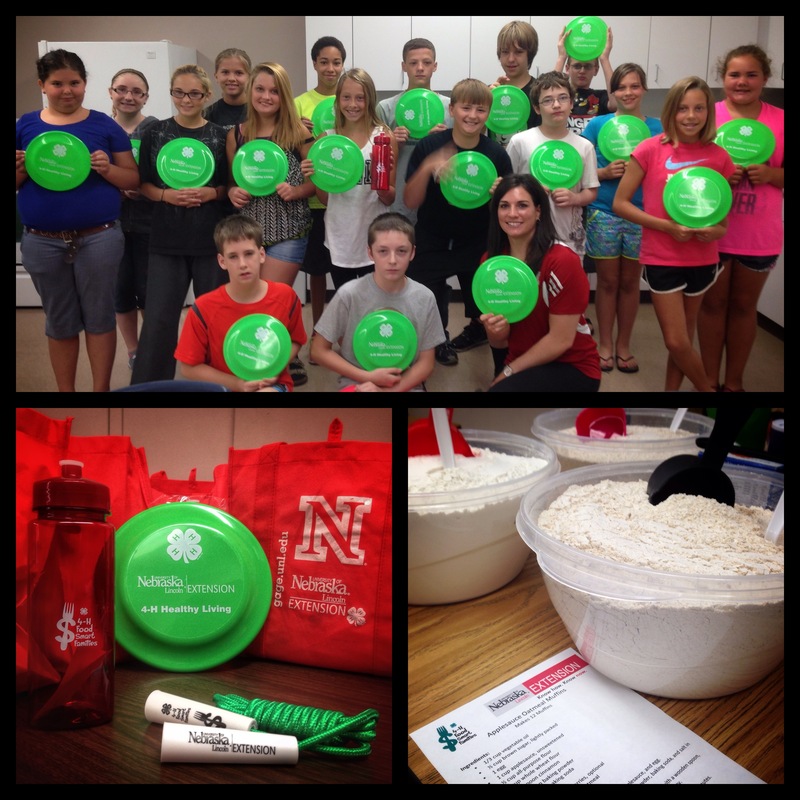 This program was available thanks to the 4H Food Smart Families grant from National 4-H Council and the ConAgra Foods Foundation. 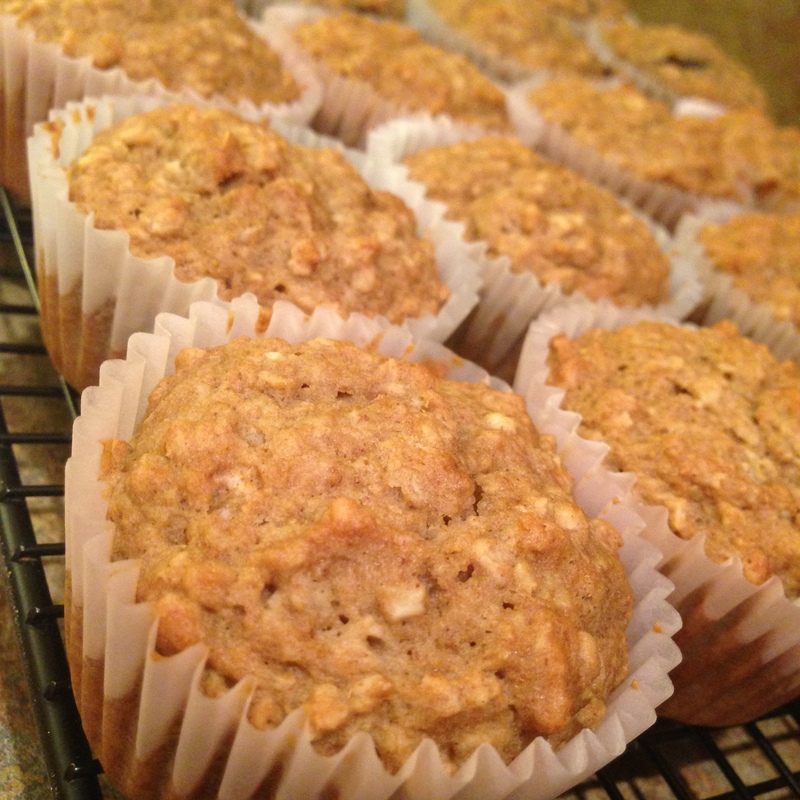 I wanted to find a recipe with mostly whole grains that the students would love! 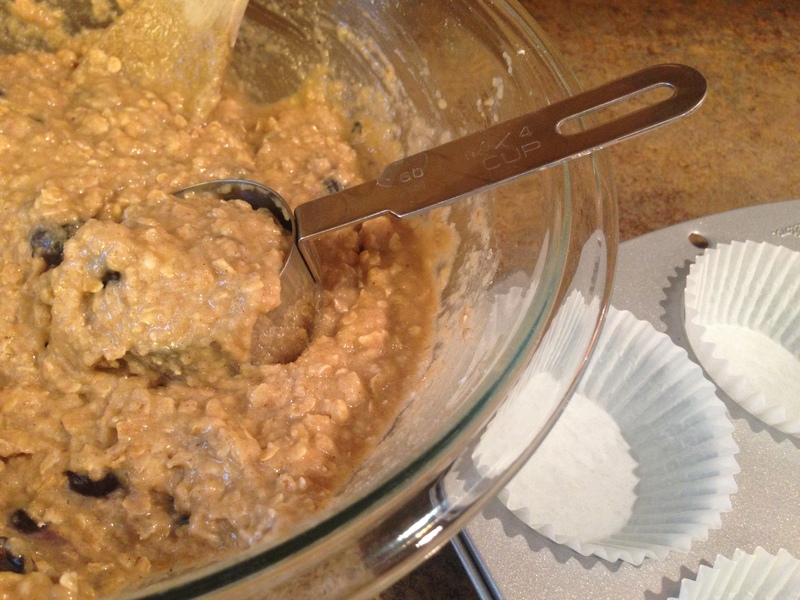 I found a recipe for “Applesauce Oatmeal Muffins” on UNL Extension’s Food Website, but I decided to modify the recipe by adding more whole wheat flour and using blueberries instead of raisins. 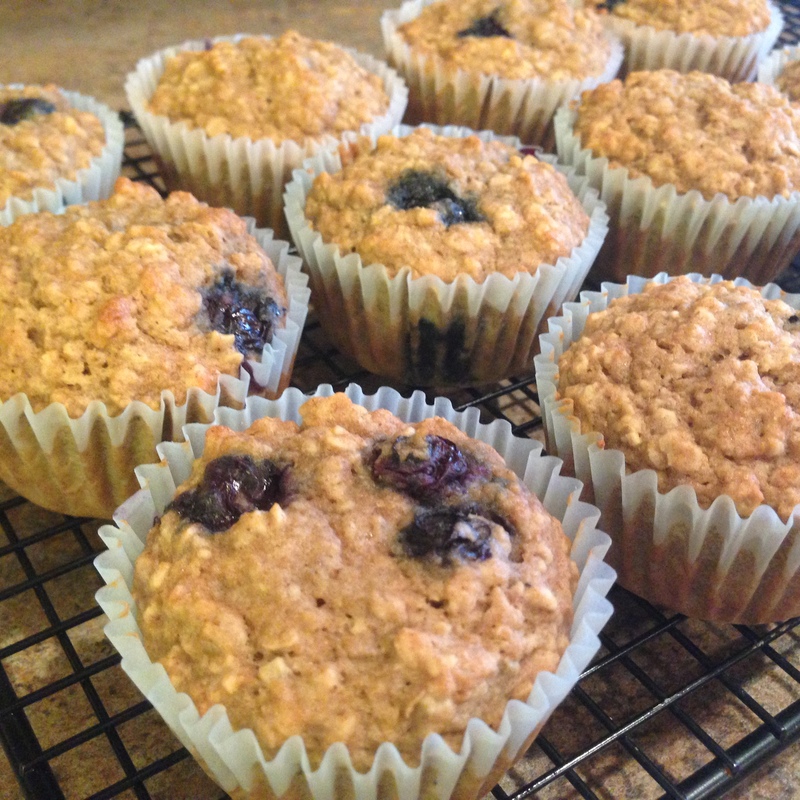 I decided to name them “Applesauce Oatmeal Muffins with Blueberries.” So original, right? The youth prepared 2 dozen muffins some with blueberries and some without for the food prep lesson. They were anxiously waiting for them to get out of the oven while they were doing other homework. After serving them with a cup of 1% milk, they asked for them to be part of a snack again. The muffins turned out to be a HIT with the youth! I ended up making 4 dozen muffins for this program. It was about 50/50 if they liked the muffins better with or without blueberries. I would say they were a success! Combine oil, brown sugar, applesauce, and egg in one bowl, mixing well. 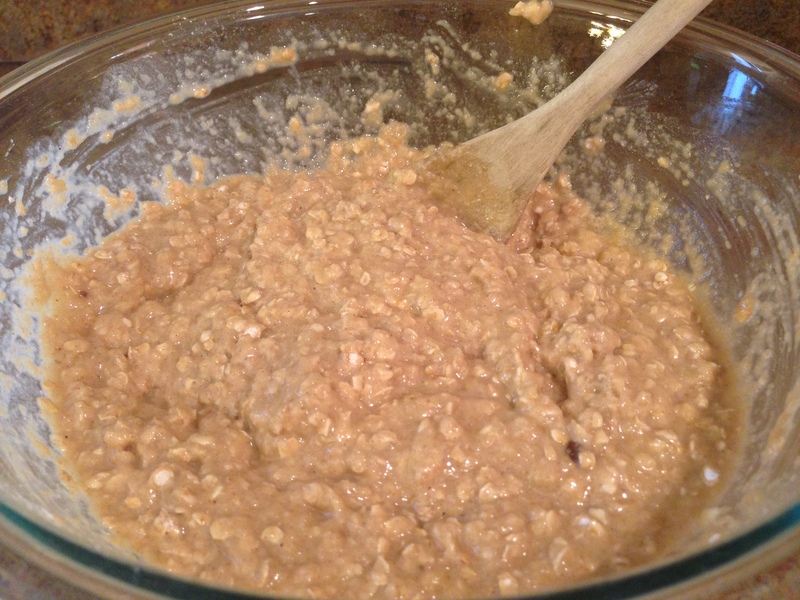 Combine dry ingredients (flours, oatmeal, cinnamon, baking powder, baking soda, and salt) in another bowl, mixing well. If you didn’t mix them before combining with the liquid ingredients, when baked, the muffins will likely get tunnels inside. Combine dry and wet ingredients, by hand with a wooden spoon, just enough to blend. Batter should still be lumpy, don’t try and smooth it. DO NOT OVERMIX. Only 10-15 strokes are needed to moisten the ingredients. This process is called the “muffin mixing method,” which is when you mix liquid and dry ingredients separately then combine them with as few stirs as possible to prevent gluten formation. Blend in frozen blueberries. You can use fresh blueberries if you like. I usually have frozen blueberries in my freezer, and I think they taste great in baked goods or smoothies. Spoon into 12 muffin cups. I like to measure a 1/4 cup of batter for each muffin cup. I take a spoon if I need to take some batter out of a cup if it is too full. Try to fill cups evenly for best baking results. 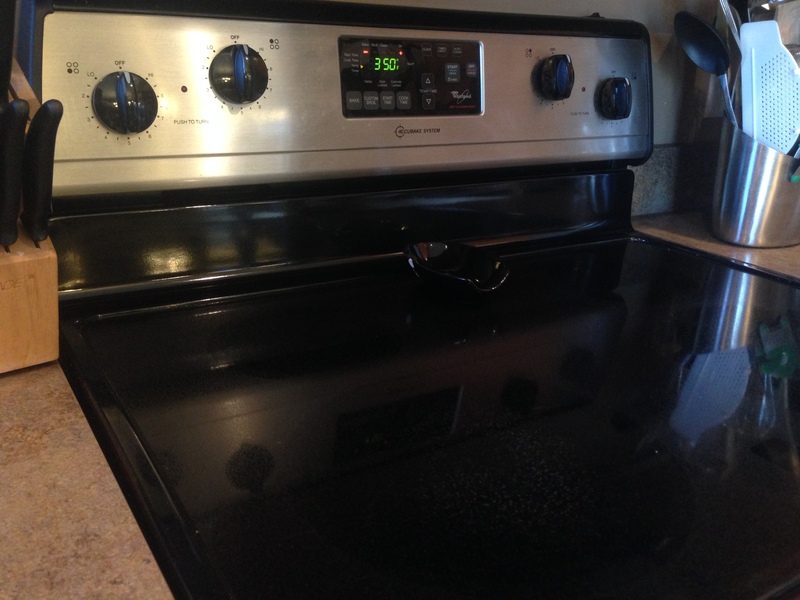 Bake at 350°F for 25-30 minutes. Muffins are done when a toothpick inserted near the center comes out clean. 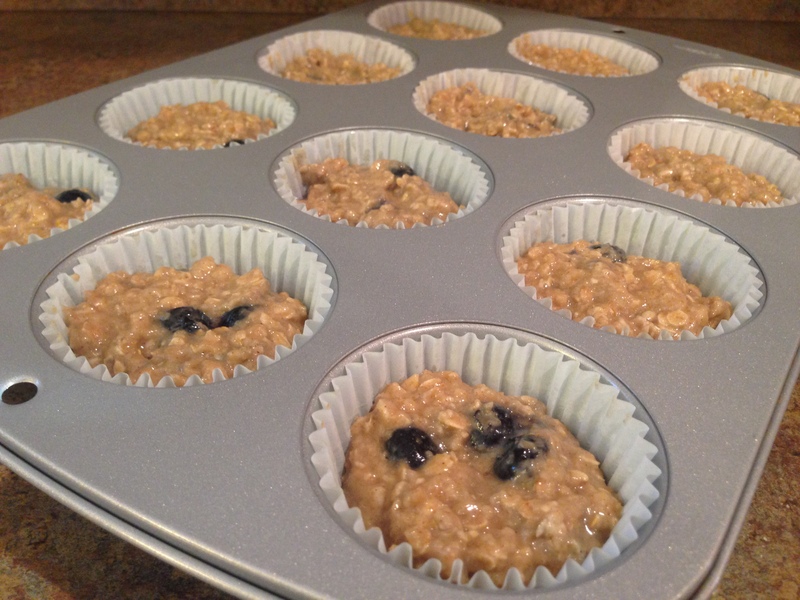 Store muffins in a covered container or plastic storage bag to prevent them from drying out. Pair it with a glass of 1% or skim milk for a healthy grab-n-go breakfast. Variations to the Recipe that I have tried and loved! 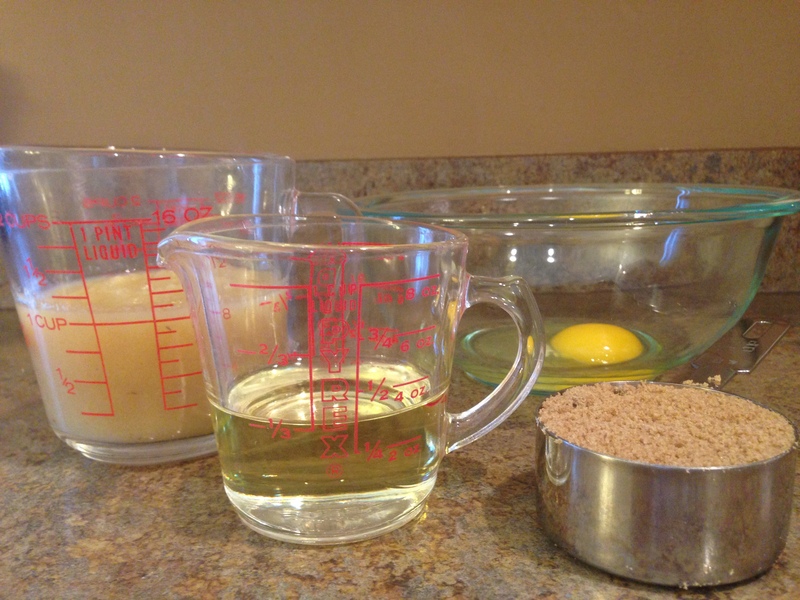 Mix together oil, brown sugar, applesauce, and egg. 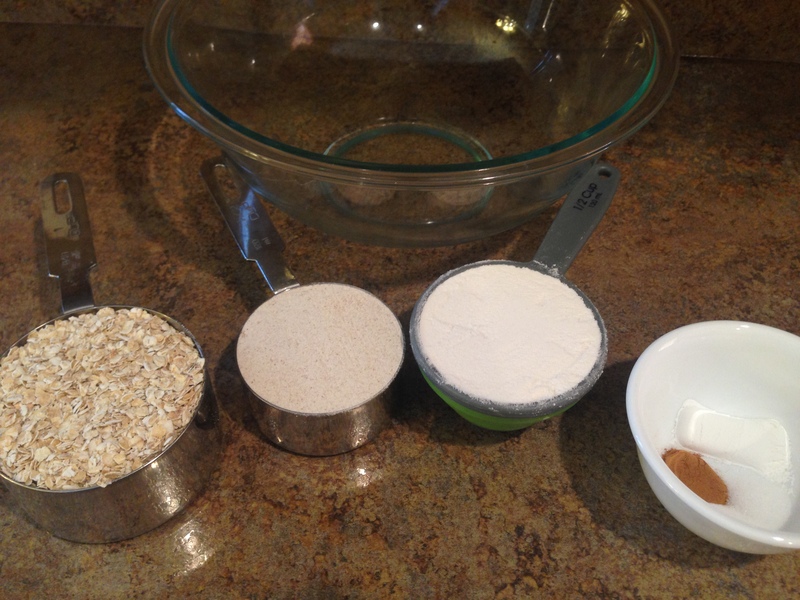 Combine dry ingredients (flours, oatmeal, cinnamon, baking powder, baking soda, and salt) in another bowl, mixing well. Combine dry and wet ingredients, by hand with a wooden spoon, just enough to blend. Batter should still be lumpy. Spoon into 12 muffin cups. Bake at 350°F for 25-30 minutes. 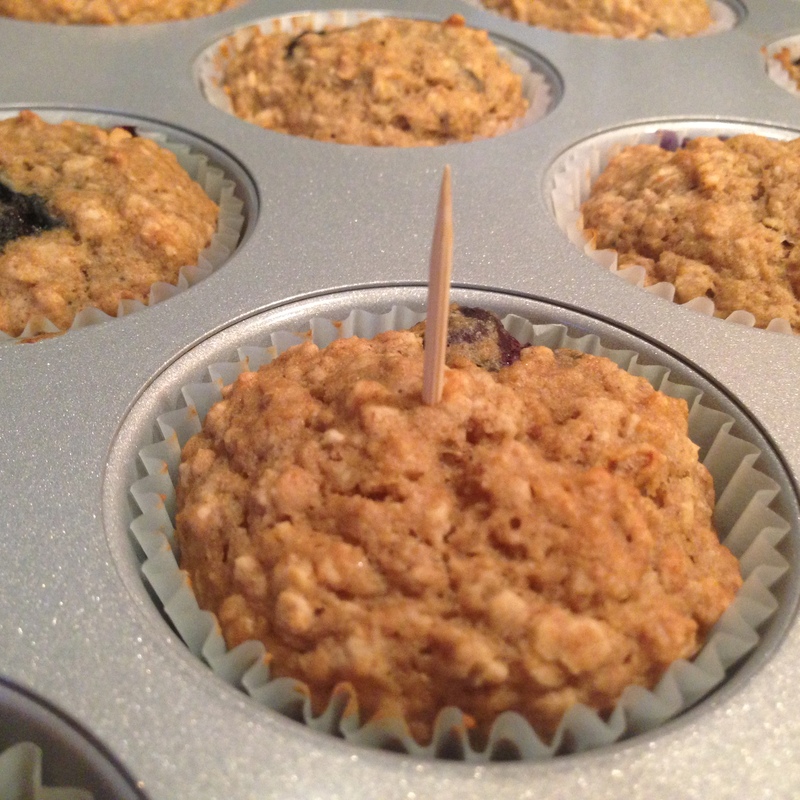 Muffins are done when a toothpick inserted near the center comes out clean. 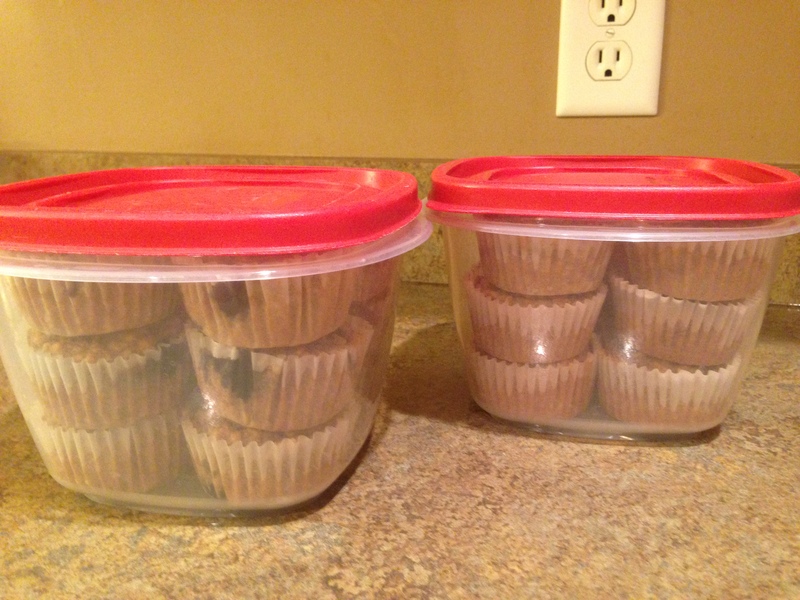 Store muffins in a covered container or plastic storage bag to prevent them from drying out. 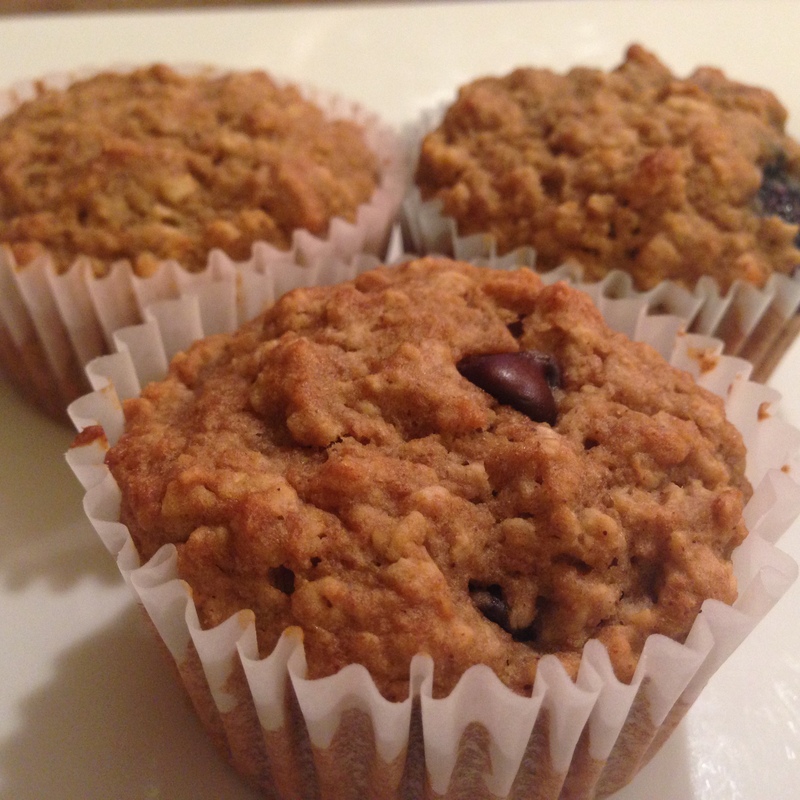 Food Groups for 1 muffin: Grains 1 oz., Fruits 1/4 cup, and Oils 1 tsp. *I used SuperTracker’s My Recipe to analyze this recipe for nutrient information and food groups. 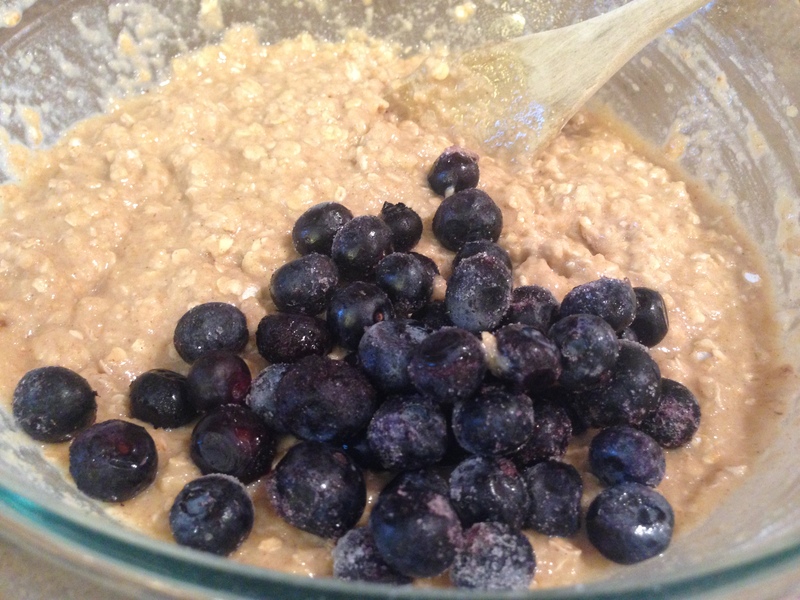 This entry was posted in Recipes and tagged applesauce oatmeal muffins, bluberry, blueberries, blueberry muffin recipe, healthier recipe, healthy, healthy eating, healthy recipe, mufffin, recipe, recipe modification, whole grain. Bookmark the permalink. Thanks Linda for the message. I’m so glad you found the instructions helpful! Hope you have a great day 🙂 If you make the muffins, let me know what you think! Thanks for the comment Jan, and I’m glad to hear you will be using this for your 7th grade class! I will send you an email about some dates that are open for me to see if they work for your class. Thanks, Kayla for this deliciously awesome recipe! The recipe instructions were so helpful to encourage my granddaughters to make these! Hi Joan, thanks for the feedback! Glad to hear my recipe encouraged your granddaughters to make these, and it was deliciously awesome! Can I possibly have the muffin’s nutrition information for the sodium, saturated fat, cholesterol, and fiber? I plan to use the recipe for a session and I anticipate participants would want to know these nutrition facts.